When puppeteer Nancy Sander asked this question at the March 23 grand opening of Cleveland Public Library’s The World of Puppets: From Stage to Screen exhibit, she was met with roaring cheers. 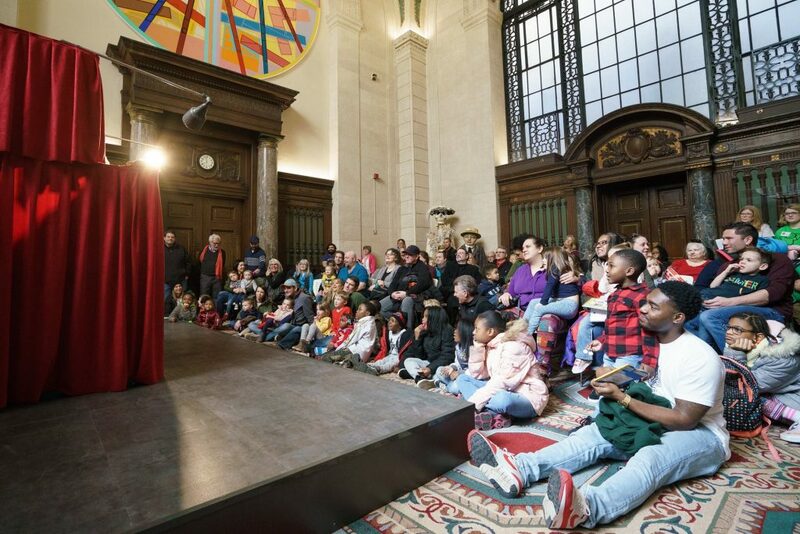 The audience—children and adults alike—packed Brett Hall in Main Library to see the day’s first performance: a traditional Punch & Judy show. According to Sander, if Cleveland Public Library had put on a puppet show when it first opened back in 1869, that show would have most likely been Punch & Judy, a puppetry classic that was particularly popular in the 1800s. It’s a fitting connection, especially considering that the puppetry exhibit honors not just the art of puppetry, but also the Library’s sesquicentennial anniversary. 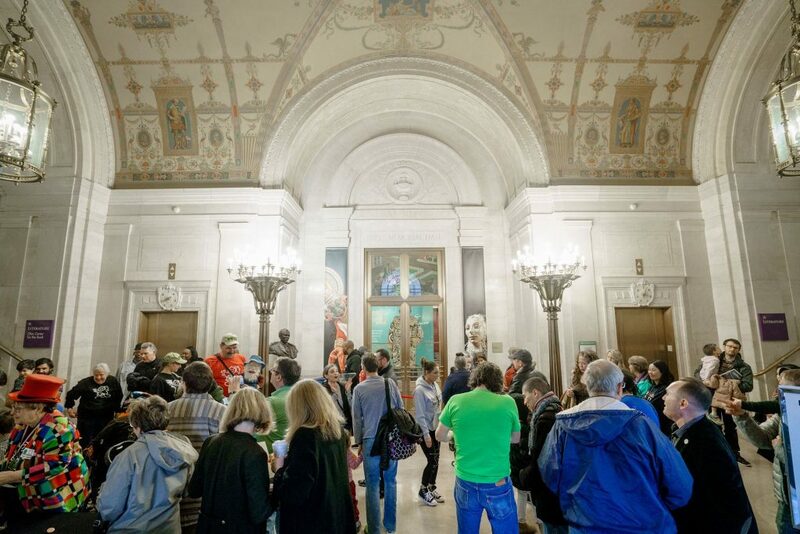 “This exhibit is the focal point of the yearlong celebration of our 150th anniversary,” said Maritza Rodriguez, President of the Cleveland Public Library Board of Trustees, who helped ring in the day’s festivities at the exhibit’s ribbon-cutting ceremony. In addition to showcasing the history of puppetry through displays of antique puppets from around the globe, The World of Puppets exhibit also includes contemporary puppets, including some familiar characters. To the delight of the young children in attendance during the March 23 opening, Sesame Street’s Elmo appeared as a walk-around character, while an animatronic Oscar the Grouch surveyed Library guests from his trusty garbage can. Elsewhere in Brett Hall, children played with puppets in the hands-on puppet theater, interacted with roaming puppeteers (one young girl challenged a bear marionette to an impromptu dance-off), and even sported the finest in puppet fashion (a Kermit the Frog t-shirt; a fuzzy blue Cookie Monster hoodie). Vincent J. Polowy, President of the Puppetry Guild of Northeastern Ohio (PGNO), pointed out that The World of Puppets has something to offer all visitors. “If they grew up in the 80s or 90s, they might recognize Audrey II from Little Shop of Horrors or Allegra from Allegra’s Window. If they’re theater fans, they’ll recognize the puppets from the original 1961 Broadway production of Carnival! And for those interested in history, there are historical puppets,” Polowy explained. Exhibit curator Bradford Clark, meanwhile, stressed that the exhibit offers a wealth of educational opportunities in areas including STEM (as evidenced in puppetry’s use of technology, mechanics, and electronics), history and social studies (by featuring antique puppets from around the world and various cultures), literature (by depicting the Hindu Ramayana epic), and religion (with Buddhist, Hindu, and Islam religions represented). Clark highlighted some of the notable offerings in display in this exhibit, including a rare example of a Sumatran sigale gale puppet, which were traditionally used in funeral rites; a dragon water puppet from Vietnam, which was rigged with tubing that once carried lighter fluid to give the appearance of breathing fire; and a uniquely designed rod-and-string puppet (Ernest Wolff’s Dancer) and its accompanying patent. 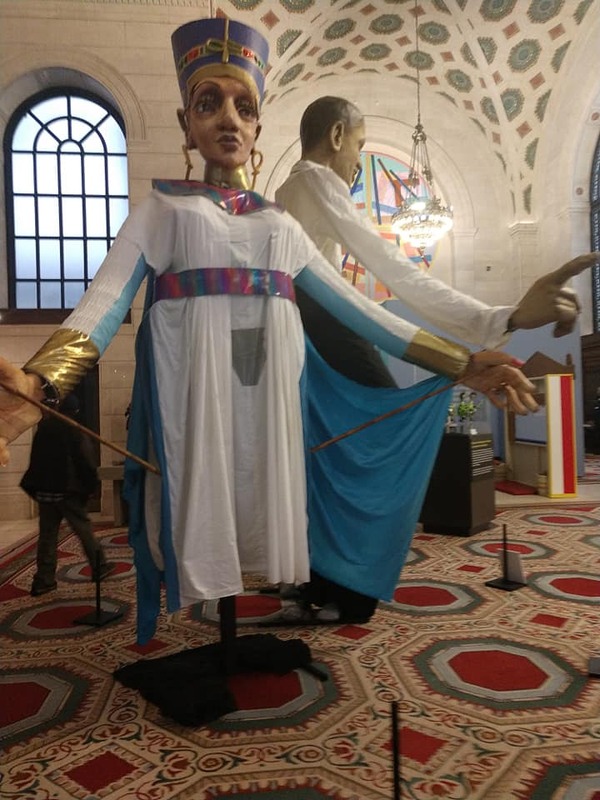 While The World of Puppets displays puppets of all shapes and sizes, visitors who stepped into Brett Hall couldn’t help but first notice the larger-than-life puppets on loan from the Cleveland Museum of Art, many of which have appeared in Parade the Circle. The giant puppets include depictions of animals and people alike, including famous figures like Nefertiti, the Egyptian queen; the artist Diego Rivera, who appears in puppet form alongside the skeletal Catrina La Calavera; and even a massive Barack Obama puppet, which proved a popular attraction on the exhibit’s opening day. Robin VanLear, Artistic Director of Community Arts for the Cleveland Museum of Art and Director of Parade the Circle, coordinated the installation of the large puppets on loan for the Library’s exhibit. (She also made the Obama puppet, which stems from a separate activist project completed during the 2008 presidential election.) She pointed out that some of the larger puppets on display in The World of Puppets are the result of collaborations among artists from around the world. The exhibit’s opening day was packed full of activities. Jim Kroupa, a puppeteer whose illustrious resume includes work on Sesame Street, various Muppet shows, Between the Lions, and Eureeka’s Castle, to name a few, discussed puppetry mechanisms in a special craft talk. By explaining his own mechanisms and stressing that anyone who’s interested can become involved in puppetry, Kroupa encouraged audience members to get some hands-on experience and learn for themselves. Kroupa gave his craft talk in the International Languages Department, which also hosted two Great Lakes National Puppet Theater performances. First, the puppeteers—including Polowy, the theater’s Artistic Director, together with Associate Director Jennifer E. Walker—performed The Shoemaker and the Elf in the Bunraku traditional Japanese style of puppetry, in which the puppeteers wear all black (including head coverings) to “disappear” as they manipulate puppets. Next, they performed Goldilocks and the Three Bears with hand puppets. Both shows played to standing-room only audiences, and attendees enjoyed complimentary popcorn, water, and juice. In the Youth Services Art Lab on the fourth floor, meanwhile, children crafted puppets of their own throughout the day, while PGNO hosted a puppet store on the third-floor lobby. The final performance took place in the Cleveland Digital Public Library, where Kevin Frisch of The Frisch Marionette Company performed The Jungle Book. Before beginning the show, which featured dramatic music, a menagerie of animal marionettes, and appealing visual effects, Fischer had a few playful questions for his young audience members. That might be true, but for attendees who swarmed the Library’s opening day of The World of Puppets, the puppets on display—not to mention the magic, creativity, and wonder they inspired—were very much alive indeed. The World of Puppets: From Stage to Screen will remain on display through November 2019 in Brett Hall on the first floor of Main Library, located at 325 Superior Avenue. This exhibit is made possible with the assistance of PGNO and the Cleveland Museum of Art, who serve as partner organizations.